After eight years, Koenigsegg's longest- running hypercar has finally finished production. It’s the end of an era: the Koenigsegg Agera range is now complete. The last two models, collectively known as the , have finished production, and have been individually named Thor and Vader. The hypercars will be driven by their new owners for the first time at a company event in southern Germany this weekend before being shipped to the UK for an appearance at the 2018 Goodwood Festival of Speed next week. Confusingly, Koenigsegg says these are “a series within a series.” That’s because they form part of an exclusive three-car Agera Final series first announced in March, which started with the . These Agera Final series cars are based on the Agera RS but come with all options available to owners at no additional cost, which includes the development of bespoke aerodynamic features. Thor is finished in two-tone clear carbon with diamond-flake in select sections of the paintwork. The body also features a large LeMans-style central fin to keep the car stable at high speeds as well as Koenigsegg’s active aerodynamic solutions. Vader, on the other hand, is finished in clear carbon with diamond flakes and features two small rear winglets and highlights finished in white gold leaf. Bespoke cutouts also reveal the skeleton supporting the function of the active rear wing. Both cars incorporate custom-designed front winglets, enlarged front and rear spoilers and the 1MW engine upgrade that bumps up the 5.0 liter twin-turbo V8 up to 1,341 hp and 1011 lb-ft of torque. The Koenigsegg Agera has been in production since 2010, making it the automaker’s longest-running model. 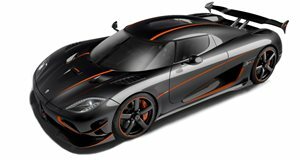 It marked a shift from supercharging to turbocharging in Koenigsegg cars, and featured the first development of Koenigsegg’s Triplex suspension system. But the Agera will be most fondly remembered for breaking five world speed records last year where it was crowned the world’s fastest production car. We’re excited to see what Koenigsegg comes up with next – and we’ll find out at next year’s Geneva Motor Show, where the will be revealed.